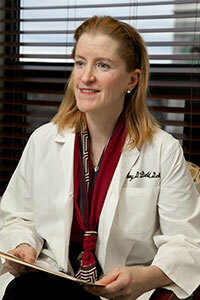 Dr. Field joined our practice in 1999 and now primarily sees patients in our Nashua office. A Board Certified Oral and Maxillofacial surgeon and Fellow of the American Association of Oral and Maxillofacial Surgeons, Dr. Field earned a Bachelor of Arts degree in Biology from Middlebury College, Middlebury, VT, in 1986. She earned her dental degree from the University of Pennsylvania School of Dental Medicine, Philadelphia, PA, in 1990. She completed a one-year residency in General Practice Dentistry the following year, and subsequently spent four years as an Oral and Maxillofacial Surgery Resident at St. Luke's/Roosevelt Hospital, New York City. Dr. Field was awarded a Fellowship at the Oral Surgical Institute in Nashville, TN, from 1995-1996. She then entered into private practice with the Oral Surgical Institute and Dr Jeffrey Carter from 1996-1998. After meeting her husband in Tennessee, she moved to New Hampshire, practicing at Dartmouth Hitchcock Medical Center in Lebanon, NH, before settling in Hollis, NH and joining our practice. She is on active surgical staff at the Saints Campus of Lowell General Hospital in Lowell, MA, and courtesy staff at St. Joseph's Hospital. She volunteers actively with the Greater Nashua Dental Connection. Dr. Field has been an active member of the Hollis Woman's Club since 2012. She served on their executive board and volunteers at their many fundraisers and social events in the community. She is also active in the local Boy Scout troop, and serves as Deacon at the Congregational Church. Her hobbies include gardening, walking and making homemade jams, jellies and maple syrup.